I found some strawberry and chocolate Dove hearts that were really good. When I was a kid, I liked the little red cinnamon hearts. Wow, this is awesome! What a great idea!! I am struggling with whether to make it or not because of my diet. I may just make it and only eat one! They look so good and bet they taste that good too. These are so pretty and festive. I'm not a 'sweet' person....but there is something special about red velvet cake! 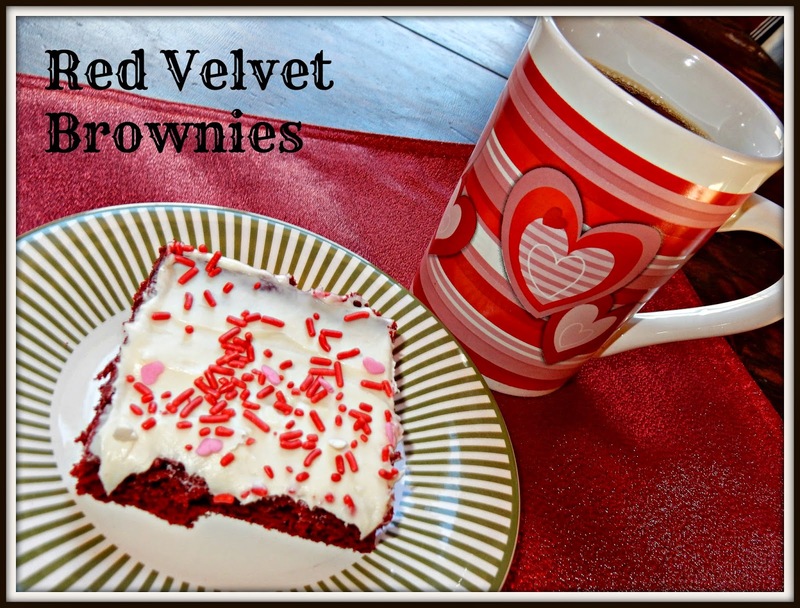 These look great - that's brilliant that red velvet brownies are available in a box mix. I think you can't beat chocolate cake for valentines! Thanks Lisa... My hubby loves Red Velvet cake ---so I will try this... Wonder if they'll do as a muffin?? I may try it. Yes, you're right the brownies is so festive and fun too. I would love to try it. My daughter said she wants those with hot chocolate! I'm thinking of making brownies as a family instead of buying the kids candy. These look like something they could help with! The boys will have a good Valentines with those! These sound so good! I love red velvet anything! Ja zo houd je ze wel bevriend. If I had a big plate of those, I'd make a pot of coffee and sit here by the fire, and eat them all. Snowing here, so that would be a good pass time. Those look yummy! Thank you for the recipe. You're such a good Mom! That looks absolutely divine! This year, I happened, by chance, to have found a small heart-shaped box of chocolates with a pic of a Corgi pup on the box. I bought that to share with Liv. Usually, chocolate-dipped strawberries are my fave. Don't know how I missed this, Lisa. Those look really good! That's basically the recipe I use for frosting without the cream cheese. I'll have to try that next time. It's true that cupcakes seen to be so very popular all over the place these days, and fancy cookies & cakes. Glad the boys approved! I have to avoid sweets so I settle for a card.